LP version. The rays of The Sonic Dawn are like a reminder that reality is only temporary. Flickering between light and darkness, their sound burns with an intensity that places the Danish trio among the top psychedelic acts of their time. Following their first two album releases, The Sonic Dawn have toured Europe more or less constantly, only returning home to focus on their biggest work to date: Eclipse. Their third full-length, is the product of a full year's labor, with all 13 tracks carefully selected from among over 40 candidates. Inspired by personal tragedies and the current meltdown of the world as we know it, the songs deal with a feeling of despair that many will recognize, but also seem to say that one can heal and come out stronger, if one dares take the leap. The result is a cinematic journey in sonic technicolor. Here, even the catchiest melody casts a mysterious shadow, and every mind-altering solo is torn out of Emil Bureau's guitar as if it owed him money. Eclipse was recorded to tape at The Village Recording, Denmark's best analog studio, and produced by The Sonic Dawn and Thomas Vang (Roger Waters, etc.). Mastered at Svenska Grammofonstudion by Hans Olsson Brookes (Graveyard, etc. ), and cut to vinyl at Abbey Road Studios, for the ultimate sound quality. LP version, limited red vinyl. The rays of The Sonic Dawn are like a reminder that reality is only temporary. Flickering between light and darkness, their sound burns with an intensity that places the Danish trio among the top psychedelic acts of their time. Following their first two album releases, The Sonic Dawn have toured Europe more or less constantly, only returning home to focus on their biggest work to date: Eclipse. Their third full-length, is the product of a full year's labor, with all 13 tracks carefully selected from among over 40 candidates. Inspired by personal tragedies and the current meltdown of the world as we know it, the songs deal with a feeling of despair that many will recognize, but also seem to say that one can heal and come out stronger, if one dares take the leap. The result is a cinematic journey in sonic technicolor. Here, even the catchiest melody casts a mysterious shadow, and every mind-altering solo is torn out of Emil Bureau's guitar as if it owed him money. Eclipse was recorded to tape at The Village Recording, Denmark's best analog studio, and produced by The Sonic Dawn and Thomas Vang (Roger Waters, etc.). Mastered at Svenska Grammofonstudion by Hans Olsson Brookes (Graveyard, etc. ), and cut to vinyl at Abbey Road Studios, for the ultimate sound quality. Into The Long Night is the second album by The Sonic Dawn, one of the most remarkable bands to come out of the new psychedelic wave in Denmark. Just a few seconds into this album, you will realize that you are in for a mind altering experience. "It's a trip! By taking the listeners to places they didn't expect to go, we hope to make them aware -- that they'll stop up and think about life for a minute. Awareness is the first step to change in the world," says guitarist and vocalist Emil Bureau. To achieve the dramatic changes of mood and feeling that The Sonic Dawn excel at, they mix a wide range of styles, from jazzy sitar pop to heavy acid rock. A pleasant-sounding, analog production makes the album easy to approach, not to water it down, but rather to pull the unsuspecting listener into the deep. The songs were written by day and recorded at night, during a month of complete isolation in a remote house by The North Sea. The track list can be interpreted as a trip through the night, into a new dawn. Close your eyes and see it: Go through the hill country with its long yellow grass, to the beach where the setting sun dances on the cold waves. Slide into the darkest hours, alone with your thoughts and doubts. Suddenly come the first blue rays, separating past from present, before a golden dawn is born and everything takes its right shape, perhaps for the very first time. Into The Long Night was made in collaboration with some of Scandinavia's most regarded personnel. It features Swedish Hammond legend Erik "Errka" Petersson on keys and Morten Grønvad on vibraphone and percussion, which adds to its soundtrack-like qualities. Mixed in The Village Recording with jazz producer Thomas Vang (Oscar Peterson, Randy Brecker, etc.). Mastered in Svenska Grammofonstudion with Hans Olsson Brookes (Graveyard, Blues Pills, José González, etc.). Fans of psychedelic rock, neo-psych, freak beat, and classic rock will surely enjoy this record. LP version. 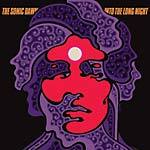 Into The Long Night is the second album by The Sonic Dawn, one of the most remarkable bands to come out of the new psychedelic wave in Denmark. Just a few seconds into this album, you will realize that you are in for a mind altering experience. "It's a trip! By taking the listeners to places they didn't expect to go, we hope to make them aware -- that they'll stop up and think about life for a minute. Awareness is the first step to change in the world," says guitarist and vocalist Emil Bureau. To achieve the dramatic changes of mood and feeling that The Sonic Dawn excel at, they mix a wide range of styles, from jazzy sitar pop to heavy acid rock. A pleasant-sounding, analog production makes the album easy to approach, not to water it down, but rather to pull the unsuspecting listener into the deep. The songs were written by day and recorded at night, during a month of complete isolation in a remote house by The North Sea. The track list can be interpreted as a trip through the night, into a new dawn. Close your eyes and see it: Go through the hill country with its long yellow grass, to the beach where the setting sun dances on the cold waves. Slide into the darkest hours, alone with your thoughts and doubts. Suddenly come the first blue rays, separating past from present, before a golden dawn is born and everything takes its right shape, perhaps for the very first time. Into The Long Night was made in collaboration with some of Scandinavia's most regarded personnel. It features Swedish Hammond legend Erik "Errka" Petersson on keys and Morten Grønvad on vibraphone and percussion, which adds to its soundtrack-like qualities. Mixed in The Village Recording with jazz producer Thomas Vang (Oscar Peterson, Randy Brecker, etc.). Mastered in Svenska Grammofonstudion with Hans Olsson Brookes (Graveyard, Blues Pills, José González, etc.). Fans of psychedelic rock, neo-psych, freak beat, and classic rock will surely enjoy this record. LP version. Limited edition orange vinyl. Into The Long Night is the second album by The Sonic Dawn, one of the most remarkable bands to come out of the new psychedelic wave in Denmark. Just a few seconds into this album, you will realize that you are in for a mind altering experience. "It's a trip! By taking the listeners to places they didn't expect to go, we hope to make them aware -- that they'll stop up and think about life for a minute. Awareness is the first step to change in the world," says guitarist and vocalist Emil Bureau. To achieve the dramatic changes of mood and feeling that The Sonic Dawn excel at, they mix a wide range of styles, from jazzy sitar pop to heavy acid rock. A pleasant-sounding, analog production makes the album easy to approach, not to water it down, but rather to pull the unsuspecting listener into the deep. The songs were written by day and recorded at night, during a month of complete isolation in a remote house by The North Sea. The track list can be interpreted as a trip through the night, into a new dawn. Close your eyes and see it: Go through the hill country with its long yellow grass, to the beach where the setting sun dances on the cold waves. Slide into the darkest hours, alone with your thoughts and doubts. Suddenly come the first blue rays, separating past from present, before a golden dawn is born and everything takes its right shape, perhaps for the very first time. Into The Long Night was made in collaboration with some of Scandinavia's most regarded personnel. It features Swedish Hammond legend Erik "Errka" Petersson on keys and Morten Grønvad on vibraphone and percussion, which adds to its soundtrack-like qualities. Mixed in The Village Recording with jazz producer Thomas Vang (Oscar Peterson, Randy Brecker, etc.). Mastered in Svenska Grammofonstudion with Hans Olsson Brookes (Graveyard, Blues Pills, José González, etc.). Fans of psychedelic rock, neo-psych, freak beat, and classic rock will surely enjoy this record.